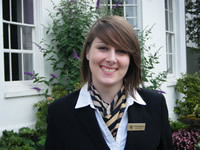 My name is Jacinta Downey and I started with Principal Hayley in June 2011 as a Graduate Management Trainee. I was placed at Beaumont Estate in Old Windsor to complete my years training programme. Over the year I followed a structured training plan and spent time in the Restaurant as a supervisor, Reception as a shift leader and in Accounts working with the purchase ledger and income audit. All of the above roles offered a level of responsibility as well as a great knowledge of the property and how it runs on a daily basis. I was also involved in managerial processes such as managing rotas, training colleagues and attending management meetings. At the end of my graduate training I was offered the position of Reception Manager at Beaumont Estate which is a flagship property of the Group, boasting over 400 bedrooms and 70 meeting rooms and I have been working in that position for seven months now. I find the level of responsibility has been stepped up greatly, I have a great Front Office Manager above me who has allowed me to be involved in payroll, forecasting, training and I was able to implement my own ideas for the department which has been very rewarding. It is very clear that I would not be in this position with out a proper basis which I received in my first year at Beaumont Estate.